2009: The co-founders, Fred and Jeremy, were on a eastern European excursion when Tortuga spawned from their one desire: remote control. The desire had a dual meaning. On one hand the two were dealing with daily equipment struggles that impacted the trip. On the other hand the two were yearning for a location-independent business. Basically, why are travel backpacks poorly designed and why does one have to sit at the same desk everyday? That's when Tortuga found its purpose.2010-2018: Bootstrapped growth. 2018: Things are a bit different now for Tortuga: a 100% remote team. Multi-million dollar business. Expanded product line. A Chinese manufacturing partner. Popular blog. This is a competitive space, a market that includes niche brands and the behemoths that can mass-market a backpack division. Nevertheless it’s a gigantic opportunity. Over seven billion people call Earth home. A bunch of them travel. A bunch of them enjoy not having to carry their items like a restaurant busboy across foreign lands. If you combine that need with a product whose only legal concerns are dimensions and containing liquid have quite the open market. The pieces are there to slowly build a strong brand and community, nibbling away at the greater travel pie. Tortuga is minimalist. The color pallet is more or less black, white, and grey. The menu contains four options: Shop, About, Contact, Blog. 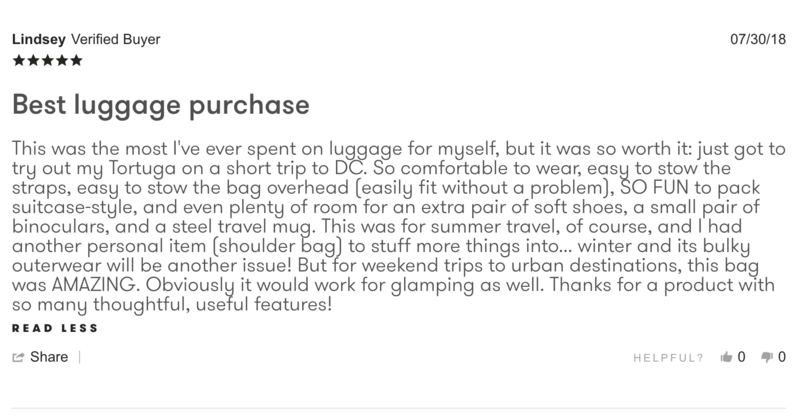 The product descriptions are light and straightforward. And all of this mirrors their products. Say no to excess! Visitors are heading to the catalog whether they like it or not. 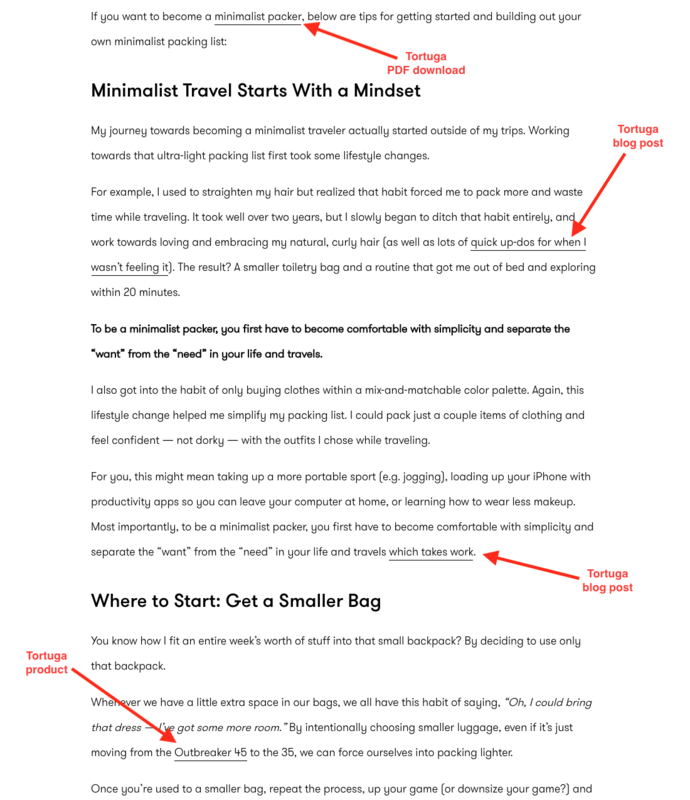 In 2017 it appears they made a major decision by going all in on their self-hosted blog, Packsmith, and turning off the lights of their Medium publication, On Your Terms. Tortuga's keeps their content light and fun with a dash of inspirational posting. Product placements are in a large percentage of their posts, hero images, and links. Shopify is a crowd favorite for small-to-medium shops. 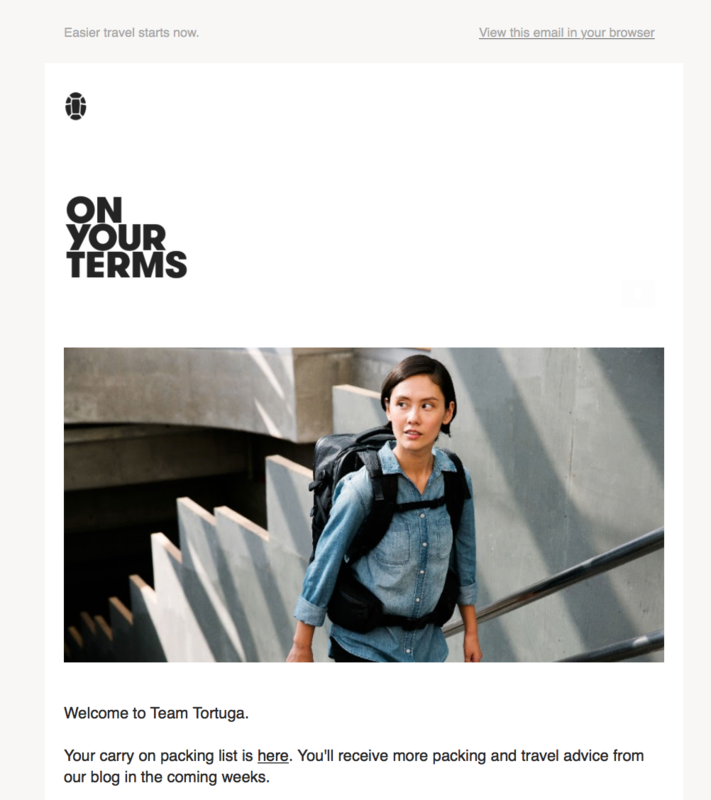 So there’s a long list on why Shopify makes sense for Tortuga: eCommerce-focused, easy interface, quick installation, SEO management, scalable pricing, SSL, etc. Google is Google. Their Analytics feature is cheap, easy to setup, and connected to almost everything on the web. 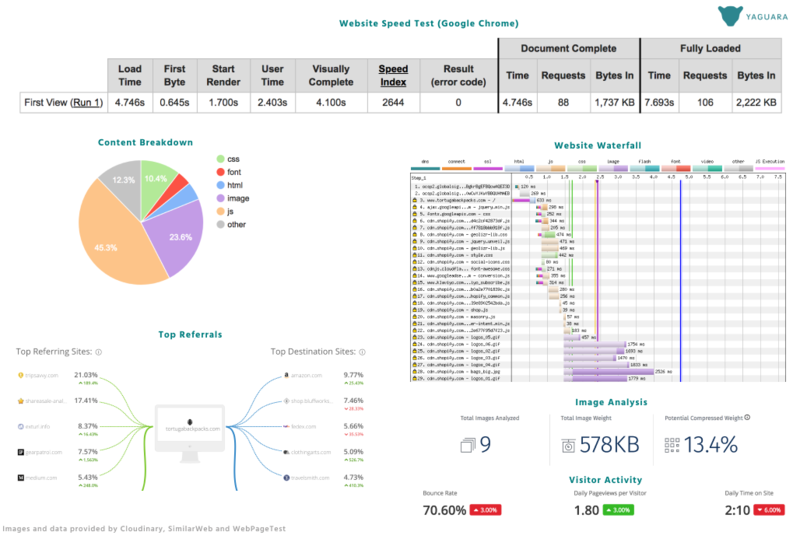 Kissmetrics lets the Tortuga team take one step further with site visitors. Instead of tracking visitors in isolated sessions, Kissmetrics allows for lifetime journey stories which leads to more accurate targeting. Sift Science offers a full suite of fraud prevention products that mitigate every type of fraud and abuse. Villains beware! Klaviyo is an email marketing tool built specifically for eCommerce stores, with means every feature released has this use-case in mind. 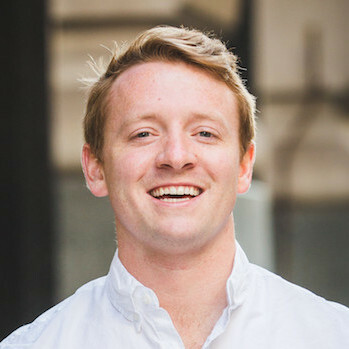 The Klaviyo team cares deeply about transactional data, such as abandon cart and winback emails, unlike competitors that emphasize speed and open rates. Contrary to its name, Sumo often operates as a small plug-in that is key to lead generation and conversion. The platform provides an interface that is fast, friendly, and ready to pounce based off of visitor triggers. Social reviews: the final and silent requirement before any purchase. 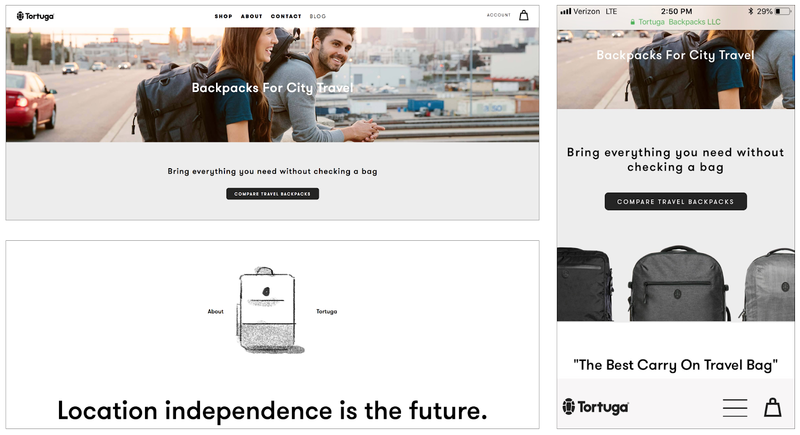 Yotpo offers a suite of loyalty and review products that nudge Tortuga shoppers over the finish line after reading of a positive travel experience. Facebook is the ultimate B2C advertising playground since users are often sharing personal interests and tendencies. 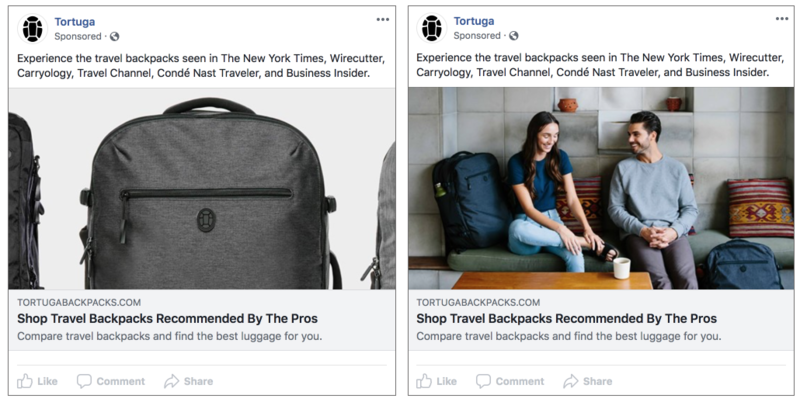 Tortuga’s target market is the everyday traveller, so Facebook Ads are the perfect place to introduce an inspiring, but friendly message. CDNs are the backbone to websites, allowing content to be stored and pulled quickly for each unique visitors. Tortuga stores most of their assets on Amazon’s CDN option, Cloudfront. This is most likely a financial decision if the rest of their technical stack is built on Amazon Web Services (AWS). How do you think $1,000 and a free backpack sounds to a History major? 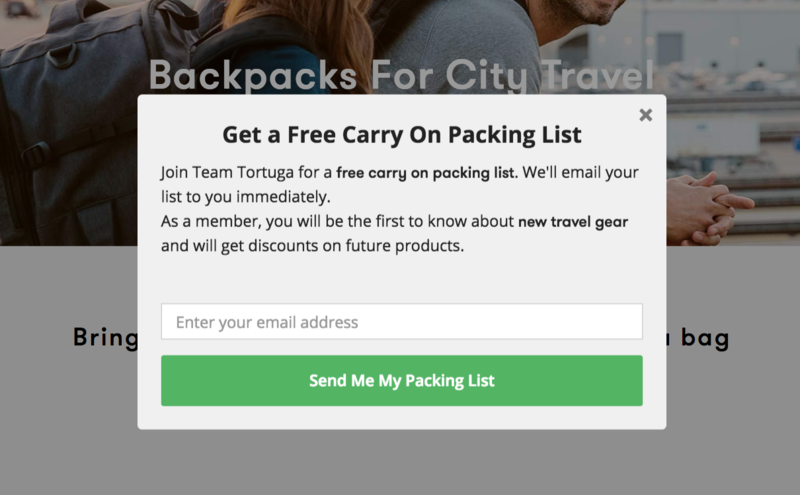 Tortuga donates directly to a university's study abroad program. The Tortuga Setout wins best in show. There are several reasons to be interested in Tortuga’s story. Anyone bootstrapped eCommerced team doing millions in revenue will raise eyebrows, mainly because of it angelic connotations. It has the "we didn’t have to go on Shark Tank and battle Kevin O’Leary for equity" effect. So if you didn’t appear on a CBS show, or take on rounds of private funding, people will wonder how they made it. Was it the mafia? No, most likely thoughtful economic and expansion tactics, which takes time. After all, this is a classic tale of the Tortuga and the hare.